An extensive new database details over 635,000 Martian impact craters, providing unprecedented information about Mars’ battered surface. Compiled by LASP scientists, the catalog will help researchers date various regions of the Red Planet, study its volcanic water history, and investigate its past potential to harbor life. The database details Martian impact craters, likely created by asteroid collisions, which are at least a kilometer in diameter. Led by LASP/CU Boulder researcher Stuart Robbins, the team used information from Martian orbiters and landers to analyze geologic features on Mars. Then, in tedious cosmic detail, Robbins drew up a map of the 635,000 crater rims—the largest impact crater database ever created for a planet or moon in the Solar System. The diameter of a Mars crater determines its age: In general, the smaller the crater, the younger it is. 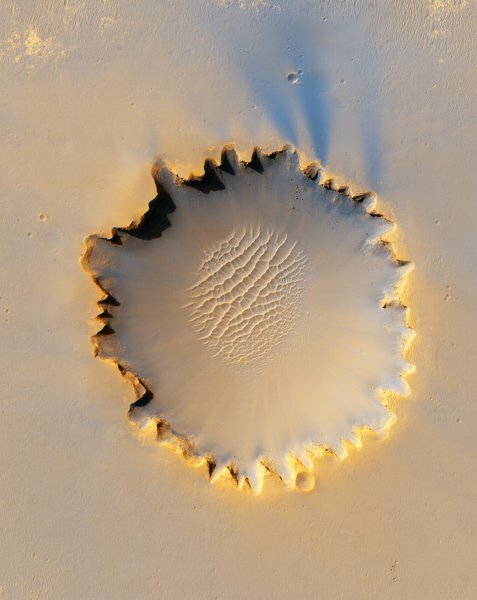 Most Martian craters are small and young, hinting at volcanic erosion that may have erased older features. Crater rim height and depth provide further information about erosion and long-term surface changes on Mars. Crater age and size could also provide information on Mars’ past potential to sustain life, said Brian Hynek, LASP scientist and collaborator on the project. Many of the large craters created hydrothermal environments that might have been habitable if water existed in the Mars crust at the time. However, like Earth’s dinosaur extinction event, asteroid impacts that could have potentially created life on Mars could have also destroyed it, Hynek said. In this way, understanding Mars’ geologic past may help unravel the early history of our home planet. The study was funded by the NASA Mars Data Analysis Program and is published in the Journal of Geophysical Research—Planets.